'A Little Place on the Corner"
Although visiting Loco Coffee, I arrived at The Artful Dodger a little early. I simply sat down and waited for Ed. The waiter kindly gave me some water whilst I waited, The place is a little open, therefore is quite easy for the cold air to come in. Seated by the door I guess did not help. This was a good summer venue, located opposite the cinema, and near some good restaurants. Situated on the corner, with outside seats, it seemed like a good place to relax and enjoy quality time with friends. The menu looked good, simple items, but all the basics were there. Eggs, toast, muesli, etc, so all walks of like were catered for. After Ed arrived, we ordered our coffee’s, and breakfast. I went for the usual, and Ed ordered a French Toast. He was fascinated by the menu, and he was stumped for choice. 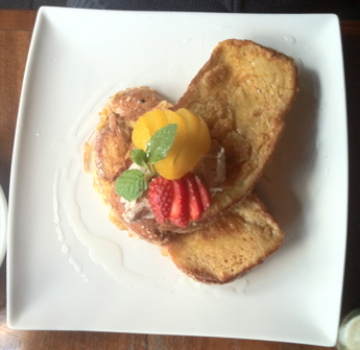 His love for French people won out in the end, and therefore French Toast was the winner. The breakfast’s looked great. Extremely appetising, and worth the effort of braving the cold morning. Ed has always been a fan of good food, and even he was impressed by the French toast he had. I am sure he will go back for breakfast to the Artful Dodger before long. My breakfast was also worthy of a mention. 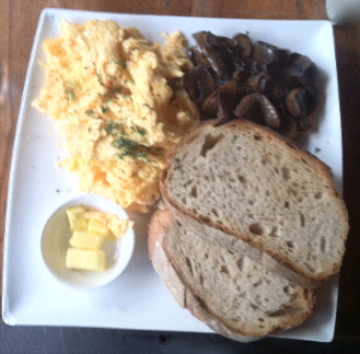 Is was delightful, with the mushrooms cooked really well, and the scrambled in a little overdone for my liking, however the overall taste for me was the victor. "2 Beans in a Pod?" “mmm, alright” were the words Ed muttered, as I gently asked him to comment on it. I wasn’t much of a fan either, however, it was better than some of the others on the Top 100 list. I always harp on Proud Mary, 65 Degrees, however, they are in a different class, according to my taste buds though. Omar is another that springs to Ed’s mind, although, admittedly, I have not tried Omar more than the once I have been there. The coffee sensation itself was a little weak in what they had prepared. Using the Ali blend, the coffee was not terrible, however, there was still some left in the machine, if I can say that. Having said this though, I am certain that it would have been a lot better than the Gloria Jeans offerings, that Ed so easily dismissed as an uninformed choice. After my first taste, it showed glimpses of greatness, however, the flavor fizzled out a little, and there was a slight tone of an unpleasant aftertaste, ever so slight. Not as bright as some might say. Rating. 5.5 Better than some, not as good as others. There are a few. But people still go there. I guess they cater for a market. 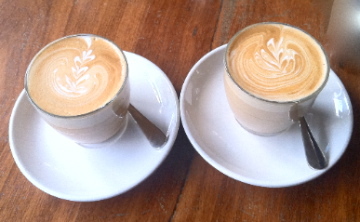 Mcafe, the little corner shops that sell mediocre coffee, half the restaurants in Melbourne. Where do you stop ? « Loco , 21st June.